VroomVroomVroom offers a huge variety of car rental brands at great prices. We are partners with trusted suppliers in New Zealand such as Avis, Budget, Thrifty, Hertz and Europcar. Just give us a few details of your travel plans, and our search engine will generate a list of cars for your trip. You can then choose the hire car that will best suit your needs. Taupo has become an increasingly popular tourist destination, as the town sits on the edge of the huge Lake Taupo. There are plenty of outdoor sports on offer such as jet-boating, and biking trails. Be sure to walk along the popular Huka Falls trail if you are in the area. Why rent a car in Taupo with VroomVroomVroom? Convenience -There are several depots to choose from so you can find the one that is nearest your place. Great rates - Get your money's worth when you book with us. Our Price Promise helps you get the best price on your rental car. Excellent service - Our accommodating customer care experts are ready to provide you with accurate information to all your queries and assist you in your booking. You can also leave us a message on Facebook. Because of its central location, Taupo is known as an events centre. In winter, Taupo is a good base for North Island skiing. In summer, there are lots of water based activities to enjoy, either on the lake, or from the Waikato River, New Zealand's longest waterway which originates at the lake. Taupo also hosts a summer concert at the end of January on the shores of the lake. Sports enthusiasts should definitely visit Taupo as it hosts the annual IRONMAN New Zealand and Lake Taupo Cycle Challenge. Every Labour Weekend, that's at the end of October, Taupo presents Graffiato, New Zealand's premier street art festival featuring a collection of New Zealand's best and most recognised street artists. There are tons of adventure activities in Taupo, which can be hard on the pocket. You can go whenever and wherever you like with the convenience of your car hire. If you are 'up the road' in Rotorua and would like to see the sights in Taupo, grab your vehicle there and drive over. Check out our Rotorua page for the best deals. The region around Taupo can experience stormy weather conditions, particularly south of the lake in Tongariro National Park. If you are travelling to alpine regions take additional care and maintain slower speeds. Taupo is located on the shore of the largest lake in New Zealand. The magnificent Great Lake Taupo fills the crater of a dormant volcano formed by a violent eruption in 186 AD. This volcano had such an effect on the world that the ancient Romans & Chinese wrote about the darkening ash and smoke that enveloped the sky. To this day, you can find hot spots along the lake shore where you can have a warm soak. Taupo's vibrant tourism scene is centred on the lake and water activities, you'll find plenty of great things to do, and you can explore them at your own time and pace with your rental car. Just check out our recommendations below. Departs daily for a 1.5 hr round trip. 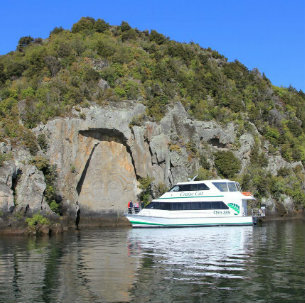 Take in the spectacular views of Lake Taupo framed by Tongariro National Park's majestic snow capped mountain peaks as you cruise to the famous Maori Rock Carvings on their large, comfortable catamaran. Family-friendly with lots of activities for the kids! Earn your wheel certificate, feed the ducks, learn some fun facts about the Lake. You might even catch a fish. Their boat is also smoke free for the comfort of all their guests. Their Cruise Cat is the best and most comfortable boat on the lake to take. It is fully enclosed and wheelchair friendly with large outdoor decks allowing a closer view of the carvings and a luxurious experience on the lake. Also, you can enjoy their famous freshly baked muffin with a hot cuppa. Want to conquer your fear of heights? Do it 15,000 ft over the central North Island and experience the sensation of flying while enjoying coast to coast views of the country. Taupo Skydive is New Zealand's BEST Skydiving experience so make sure to plan your dive on a clear sky day to get the very best of your jump. The Spa Walk is a two hour path which will take you to the impressive Huka Falls. The path includes a bridge over the naturally hot Otumuheke stream, where you can sit for a soak. Follow the sound of mighty Huka Falls roaring, and have your camera ready as they come into sight. Bruce McLaren Taupo Motorsport Park is the country's premier driving training and motorsport facility. This is an international qualifying race circuit and NZDRA approved drag strip. Drive your car rental and witness the top world motorsport events, making Taupo Motorsport Park 'The Home of New Zealand Motorsport'. Not only is this a place for adrenaline adventure, it is also a venue for conferences, corporate functions, driving training, and the ultimate race experience, Ricoh Taupo Motorsport Park brings a different driving experience to New Zealand. This is one of New Zealand's best geothermal experiences. It is located between Taupo and Rotorua, but is nearer to Taupo, just a 25 minute drive away. Part of the experience is a ferry ride to the site, across a mystical, steaming lake. Marvel at the white silica sinter terraces, and follow boardwalks through impressive geothermal fields. 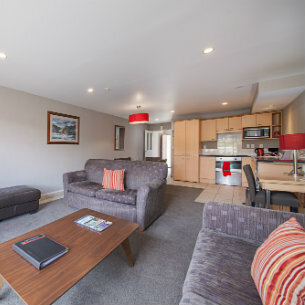 Voyager Apartments Taupo offers spacious self contained serviced apartment accommodation available for one (1) night or extended. All apartments feature air conditioning, full kitchens and laundry, and offer 1, 2 and 3 bedroom configurations, all complete with contemporary furnishings, king size beds, Sky TV with 51 Channels, Free WiFi, free car parking and cozy two person spa baths. All apartments are serviced Daily and offer a Hotel standard of guest experience but feeling more like a home away from home. The year round heated outdoor swimming pool and plunge pool and the quiet locale close to the Lake shore and within an easy stroll of the Town Centre, all complete this year round resort. Qualmark 4 star Self-contained & Serviced. Ranked #2 of the 72 Hotels in Taupo [Tripadvisor] This pristine accommodation offers nothing but the absolute best service, comfort, location, amenities and rooms you can get from a luxury apartment. With its gaping wide windows, you get the most picturesque, breath taking views of lake Taupo making this stay, and experience one to remember for a life time. This accommodation will provide a memorable experience for backpackers with its urban village atmosphere and theme. Great facilities and service, with the added bonus of being easy on the pockets, allowing you to really enjoy the many attractions available in Taupo. Ranked #1 of 108 Restaurants in Taupo- Tripadvisor. A European Cuisine that has consistent top reviews such as... "Decent pricing for exceptional food and great service, everything that's ever been put in front of us has been perfection, and we keep coming back for favourites like the calamari dish, pork belly and duck!" This local favourite is the top ranked cafe in Taupo - Tripadvisor. And with its cute, quirky decor, large variety of food and friendly staff, makes for a top rate experience. So find out for yourself what all the fuss is about and score yourself a unique coffee friend like the one in the picture. Avis Taupo - 61 Spa Road, Taupo, NI. Budget Taupo Downtown - 108 Rifle Range Rd, Gull Petrol Station, Taupo, NI.